Recently for the first time I watched Mel Brook’s movie Robin Hood: Men in Tights in English and was surprised it is actually a decent movie. I only knew the German version before, which is, like many German versions of foreign language comedies, abominable. Not only are they not able to translate gags correctly (which is pardonable, it can be really hard), they are trying to put gags where the original never intended them. Bad gags. For example: Monty Python’s Quest for the Holy Grail was a wonderful movie until the translators came along. First they changed the title to Ritter der Kokosnuss, which is, retranslated, “Knights of the Coconut”. But then things started getting really bad. Really! I’m not kidding you. If movies are made by well-known comedians, like Jerry Lewis, Louis de Funes or Woody Allen, they very often change the title as to include the first name of that actor. Yes, of the actor, not the character. For example, Woody Allen’s movie Take the Money and Run, was renamed Woody, der Unglücksrabe, which is “Woody, the Jinx”, although his character is still (as in the original) named Virgil Starkwell. It seems as if this absurd practice at least has stopped in the last decades, but when it was around, it even sometimes happened to movies that weren’t even comedies, like the original Ocean’s 11, which became “Frankie and his cronies” (where they at least changed Danny Ocean’s first name to Frankie to match Sinatra’s). But I digress. As much fun as rants like that are, my topic was something different. 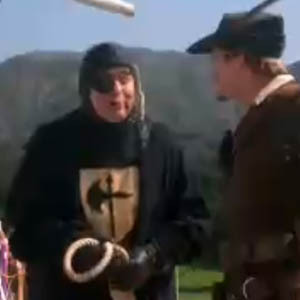 As I mentioned, I watched Men in Tights and there I noticed a curious thing. There is that scene where Robin Hood is to be hanged and the hangman is making silly comments. This hangman had sewn on his frock a golden shield with a halberd shape in it. It does not make too much sense, but then I remembered where I had seen this exact thing before. It was in that legendary, infamous anti-masterpiece by Ed Wood, Plan 9 from Outer Space. Note that the person waring this is “the Ruler”, who is the, well, ruler of a band of extraterrestrials who arrive on earth in a flying saucer (played by John “Bunny” Breckinridge, who in real life seems to have been a drag queen). 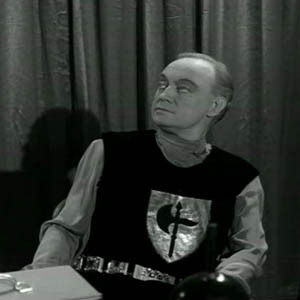 This person wearing a knight’s shield with a halberd on his breast is saying a lot about Ed Wood and why this movie has the kind of reputation it does have. By the way, if you ever have the chance of watching it, do so by all means! It is easily on par with the best of Mystery Science Theater 3000, even without Tom Servo and all. So anyway, the executioner has that halberd and the Ruler has it. And it seems to me it is the same. Not similar; identical to the last slight bend in the back. See for yourself! Plan 9 being black and white, we don’t know the color of the shield, but I strongly suspect it was golden too. But, in the name of all that is good, why? The other possibility is that Mel Brooks knew Plan 9 (this I think, at least, is certain) and intentionally choose to hide this reference in his own movie. What makes this weird is that there just is no reason at all to hide this reference in this place. It is completely non sequitur. In short, I can’t believe it is a coincidence, but beyond that I don’t have a clue. If you know more, please let me know! (I might try to write to Mel Brooks about it, but then again it is not all that important.) What’s your take?